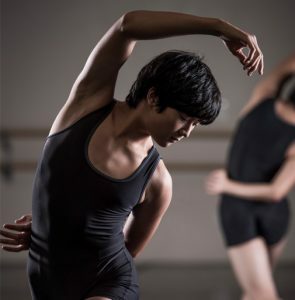 This advanced program is for dancers who want a challenging summer experience that will accelerate their ballet and contemporary dance training in an intimate, individualized setting. The Advanced Summer Intensive runs June 17 – July 27, 2019 with four divisions serving intermediate and advanced dancers ages 12-22. Students will train up to 8 hours per day Monday-Friday with rigorous and invigorating classes designed to diversify their capacity for movement. An optional 2-hour ballet technique class is also available on Saturdays. Former dancer under Twyla Tharp and White Oak. Repetiteur/methodology of William Forsythe, Ohad Naharin, Jirí Kylián. Ballet, Pre-Pointe or Beginning Pointe, Variations, Modern, Jazz, Hip Hop, Contemporary, Character, Health & Wellness Seminars, Video Studies, and Dynamic Stretching. • Special classes offered for male students. • Class size is limited. • Special seminars may be added throughout the intensive. • CCD boasts 5 beautiful studios with beautiful views of the Rocky Mountains. • Dancers will have access to Physical Therapy, Fascial Distortion and a full Pilates studio. Dancers in Advanced 1 or 2 who are interested in participating in Nutcracker 2019 need to take 4 weeks of summer intensive (which includes 20 ballet classes; 8 minimum at CCD). Please see additional Nutcracker Participation Information here. Dancers in Advanced 3, 4, or PPP who are interested in participating in Nutcracker 2019 need to take 4 weeks of summer intensive (which includes 30 ballet classes; 10 minimum at CCD). Please see additional Nutcracker Participation Information here. Students who are enrolled in at least weeks 3-6 are invited to perform in CCD’s Summer Moving Project. This valuable program allows students to learn contemporary choreography and classical repertoire in an intensive rehearsal process. Divisions 5-8 will have additional rehearsal times throughout the week. Students enrolled in all 6 weeks receive 2 weeks of additional rehearsal time and may be cast in additional works for the showcase. This extensive rehearsal process will culminate with the Summer Moving Project on July 27, 2019. Additional fee for Summer Moving Project is $250. (14+, Advanced 2, 3, 4 and PPP) Fully chaperoned housing is available for Advanced 2, 3, 4 & PPP students. Transportation and 3 meals per day included. Housing requests for those under the age of 14 will be considered, but are not guaranteed. Housing for the summer 2019 Advanced Summer Intensive will be at Williams Village on the CU Campus in Boulder, CO.